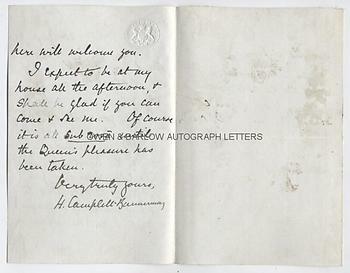 SIR HENRY CAMPBELL-BANNERMAN Autograph LETTER Signed. British Liberal Prime Minister (1905-1908). ALS. 2pp and integral blank leaf. War Office. 20th August 1892. To [William] Woodall. Together with a fine portrait photograph of Campbell-Bannerman. "At last! I am able to communicate with you. I hope you will be willing to come to your former haunts, in accordance with the invitation Mr. Gladstone has sent you. I shall be delighted to have you as a colleague and I am sure everyone here will welcome you. I expect to be at my house all the afternoon, and shall be glad if you can come and see me. Of course it is all sub rosa until the Queen's pleasure has been taken." 8vo. Approx 7.5 x 4.75 inches. Some browning and mounting residue to the verso of the blank integral leaf but the text leaf is in fine condition. 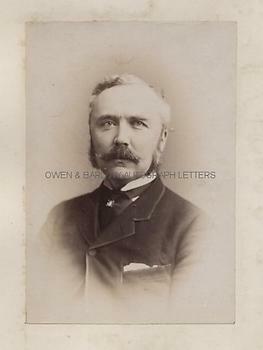 The portrait measures approx 5.75 x 4 inches (excluding mount) and is a fine 19th century gelatin silver print photograph mounted on card from album leaf. It shows Campbell-Bannerman in vignette head and shoulders, gazing confidently at the camera. There are mounting traces to the verso of the card mount but the photograph is in fine condition. Both the LETTER and the photograph are from a 19th century collection made by the radical Liberal M.P., William Woodall. At the date of the letter, Campbell-Bannerman was Secretary of State for War in W.E. Gladstone's new government. 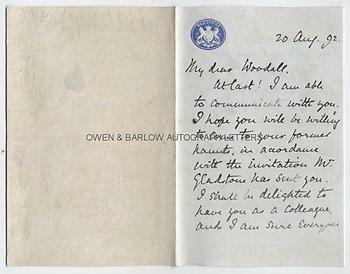 The post offered to Woodall (which he accepted) was Financial Secretary to the War Office. 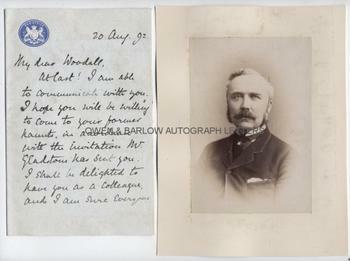 Woodall and Campbell-Bannerman had previously worked together in Gladstone's ministry of 1886, when Campbell-Bannerman was Secretary of State at the War Office and Woodall was Surveyor-General of the Ordnance.